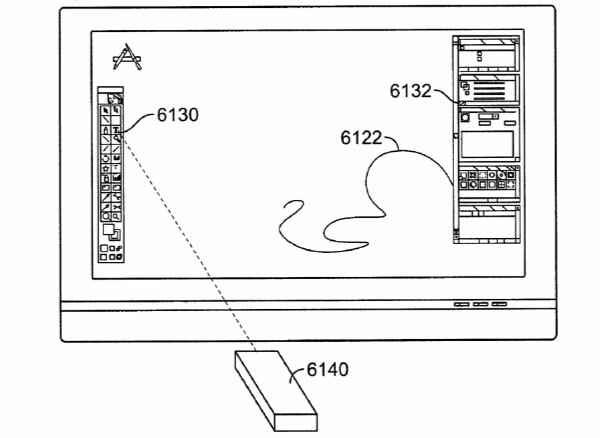 We may see a “remote wand” in the box of the next Apple TV, according to a 64-page patent filing published this week. The wand would control the movement of a cursor on a TV screen much like the Wiimote allows in, say, your home screen. It would also allow for 3D controls. Did they talk to Nintendo about this first? The wand could support more features for the Apple TV system (if Nintendo doesn’t bar its relesase), including zooming and rotating operations and keyboard, image, illustration, and media applications. For example, instead of navigating to letters with the arrow keys in the current remote, the wand allows you to quickly mouse over to the letters. The wand could serve as a digital pen for an illustration application (pictured above), but I don’t see a real use for an MS Paint-like application on your TV. In my opinion, I do not want to feel like I am navigating a PC (or a Wii) on my TV screen, but I’m curious to see if this actually gets implemented and if people will find it appealing. Honestly, I don’t even want to see another Apple TV. I want to see more Roku-like set top boxes.